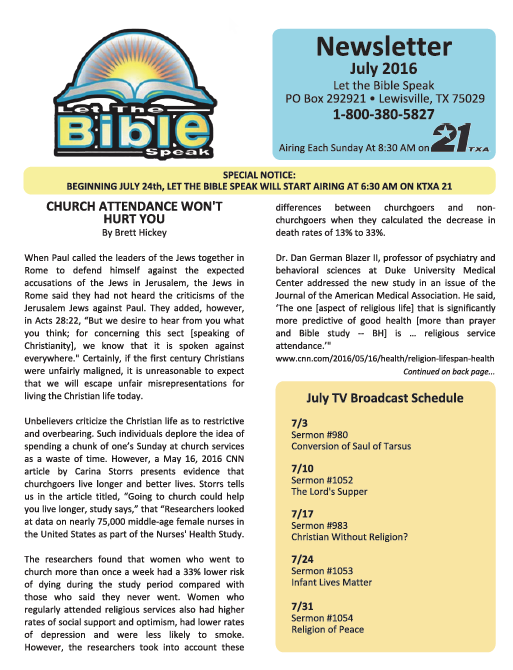 Monthly TV Broadcast Schedule for Let the Bible Speak, including the sermon title for each Sunday of that month. An article on a Bible-based topic. Upcoming gospel meetings and other events in the North Texas area designed for spiritual growth. List of other congregations in the area committed to the same Bible-based practices. How to connect with us via social media such as WWW, Facebook, and YouTube. Other news related to Denton County Church of Christ and Let the Bible Speak. To read, click month above.. When finished, click back arrow on browser.